Guard your family's health and insure your mattress investment! Preserving your mattress with a Malouf Sleep Tite mattress protector is essential. 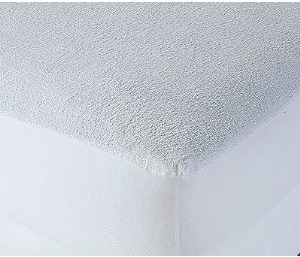 Sleep Tite’s fabric is 100% waterproof and will protect your mattress from all liquid stains. The Malouf mattress protector eliminates moisture and skin cells in your mattress that create an optimal environment for the breeding of bacteria and dust mites. When a Sleep Tite mattress protector is purchased with a new mattress, Malouf will warranty the mattress against stains for fifteen years. Every night, your body sheds millions of skin cells and loses up to one liter of bodily fluid through your pores and mouth. Up to two million dust mites can live in your unprotected mattress. Dust mites survive on dead skin cells and bodily fluids that are abundant in your bed. Allergic reactions are caused by the waste and skin these dust mites leave behind. 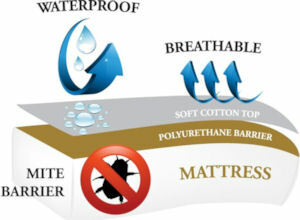 Utilizing a Malouf Sleep Tite mattress protector will eliminate dust mites and allergens from your bed. Allergic reactions from contact with dust mites can include a runny nose, itchiness, congestion, sneezing, coughing and watery eyes. Sleep Tite mattress protectors cut off the food supply to dust mites, making it impossible for them to survive. Exposure to dust mites has been proven to lead to the development of asthma in young children. Allergens produced by dust mites are the most common trigger for asthmatics. Dust mites have been shown to be a leading cause of eczema. Everyone should insure their mattress against all liquid stains, including accidental spills, incontinence and bodily fluids. If a stain reaches the mattress, any warranty with the mattress manufacturer is void. When a Sleep Tite mattress protector is purchased with a new mattress, Malouf will warranty the mattress against stains for fifteen years. Sleep Tite’s innovative design allows body heat to pass through the mattress, maintaining a comfortable sleeping temperature. The Sleep Tite fabric is quiet and will not change the feel of the mattress. Polyurethane backing is waterproof and breathable. 100% Cotton terry surface absorbs up to one liter of liquid. Protects your mattress in cases of incontinence and bed wetting. Fifteen Year mattress warranty against all liquid stains. 100% Waterproof - repels all liquids including bodily fluids, perspiration, urine and accidental spills. Fits Mattresses from 6" to 22"